O Ye of Little Faith in Los Angeles! Eric Garcetti Has a Message For You. The spirit moves him: L.A. Mayor Eric Garcetti, pointing to a higher moral authority. Photo courtesy of Nick Ut/Associated Press. 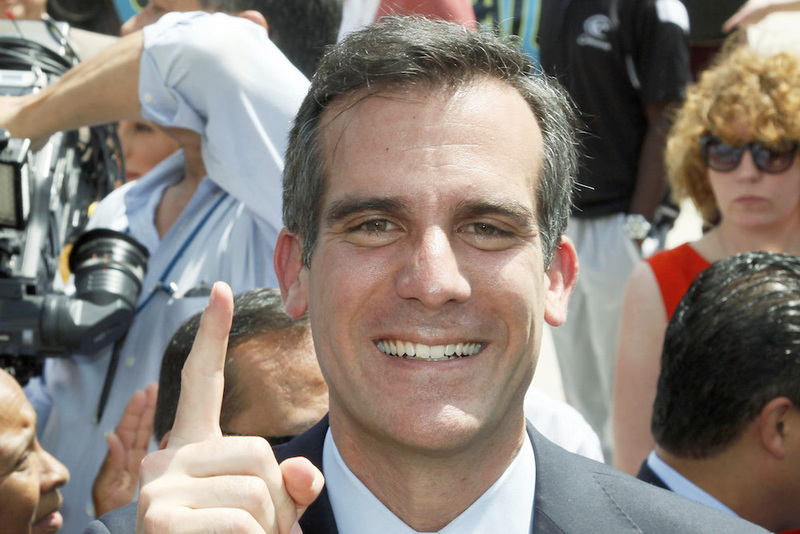 Los Angeles Mayor Eric Garcetti is being coy about whether he’s running for president. But he doesn’t fool me. I’ve already written the speech, or perhaps I should say sermon, that he should give when he announces his candidacy. America, I offer myself today to our country so that we might restore a sense of decency, kindness, propriety, perspective, respect, groundedness, community, morality, and—yes—a fear of God. I come from Los Angeles. I hear you laughing, but I am not trying to be funny—not even in a darkly ironic Big Lebowski way. But I can understand you thinking of such a candidacy as a joke. I’m a mayor, not a governor or senator (though my city has more people than 22 states). And I know that Los Angeles is a city that people love to hate—a modern Sodom, fake, superficial, and cynical. But fundamentally, L.A. is grounded in something else, something that America needs more than ever. All of today’s American crises—around Trump, democracy, environment, economy, social mobility, immigration—are really part of one larger crisis of faith. And, believe it or not, Los Angeles is the American capital of faith. I hear the howls—aren’t you just a bunch of godless liberals? Well, liberal, mostly (though L.A. did produce a number of Trump’s most hateful aides). But godless? Hell, no. God may live in heaven, but he has a second home in the City of Angels. I’m talking about more than Cecil B. DeMille’s, The Ten Commandments. For a century, Southern California has been our country’s cradle of new religions. In the early decades of the 20th century, L.A. provided a platform for the preaching of Charles Fuller, Bob Shuler, and Aimee Semple McPherson. We birthed Pentecostalism during the Azusa Street Revival, and established the Bible Institute of Los Angeles. And that’s the just the Christian side of the story. It still can’t. After the Second World War, Los Angeles was the site of Billy Graham’s first great evangelistic crusade. Then Southern Californians pioneered the megachurch movement, with the Crystal Cathedral and Calvary Chapel, and eventually Rick Warren’s Saddleback Church—all in Orange County. Today, the religious revival continues with big churches like super-diverse Oasis and millennial-friendly Mosaic. And we are home to major houses of worship for every significant world religion—and dozens of lesser-known faiths. No one does God bigger than us. Why all this fervor? Because, even though Angelenos might look like life’s winners, with our pretty faces and whitened teeth, our region is the world’s biggest collection of losers. We are people, or descendants of people, who lost at politics, commerce, love, family, or religion someplace else. Indeed, my own diverse ancestry—I’m Jewish, Italian, and Mexican—is really just different flavors of loss. L.A. has grown more through busts than booms —we’re the people who stuck around after the collapses of railroads, agriculture, oil, and aerospace. God may live in heaven, but he has a second home in the City of Angels. There are three strong L.A. faiths—a welcoming spirit, a can-do spirit, and a fear of God’s judgment—that have grown weak in the rest of the country. A Los Angeles presidency would seek to restore all three. Here is a religious text for each. Through riots, serial killers, and Prop. 13, L.A. has retained its first faith—a welcoming spirit. We love visitors, and we’ve learned to appreciate immigrants, who make our neighborhoods safer and more vital, buy our homes when we retire and die, invent new things, make new art, and join our families. We know that when we protect immigrants we are protecting ourselves. I don’t often quote St. Paul, but that’s one famous expression of the can-do spirit. And it can be hard to do anything in California, between the expense and the regulation (I would add the unions and the environmentalists to the list of obstacles, but I need their endorsements). Still, our city does. You may think we’re just a car culture, but we are investing billions over the next 50 years—through multiple sales taxes that our people themselves overwhelmingly approved—to build a new transit system with new rail lines. We’ve made our city dramatically safer, reviving South L.A., rebuilding our schools, transforming downtown, and bringing huge new resources to one of our most stubborn problems, homelessness. And if L.A. can do all this, there’s no earthly or divine reason that the United States should be unable to tackle its big problems. OK, that’s not from the Bible, the Torah or the Koran. It’s from The Shawshank Redemption. But it’s fitting. We Angelenos profoundly fear God’s power to destroy us. That is the spirit our country needs. Don’t deny climate change—fight it and mitigate it, as we do. As mayor, I promised to reduce the temperature by three degrees. Seriously. I know we elect people, not spirits, as presidents. And I have as many faults as the ground beneath L.A. Angelenos will tell you that I’m way too cautious, and afraid of conflict. They may have a point. But when you look at President Trump, caution and conflict-aversion don’t sound so bad, do they? And I’m not as cool as California’s other presidential wannabe, Kamala Harris. But you know something? She’s from San Francisco, but a couple of years ago, she got married and moved to L.A. I appreciate her showing such faith in our city—and in me. My fellow Americans, let’s get this country back to that spirit! Let’s get this country back to God! And let’s get this country back to Los Angeles!